The caption beneath this 1862 lithograph by French caricature artist Honoré Daumier reads “Nadar elevating Photography to the height of Art.” The print comically typecasts Gaspard-Félix Tournachon (known as Nadar) as a mad scientist or absent-minded professor figure who—in his excitement to capture the perfect shot—is unwittingly about to lose his top hat. Below him, inscribed on every building in Paris, is the word “Photographie.” In many ways, this satirical depiction of one of the most prominent photographers in Paris works to capture the essence of the 19th century debate over whether or not this new medium of photography could be considered “art.” At the time this print appeared in the journal Le Boulevard, Nadar was already well known for taking the first aerial photograph of Paris four years earlier in 1858. He likewise “had a flair for showmanship, and was much in the public eye as a balloonist” (Gernsheim 57). 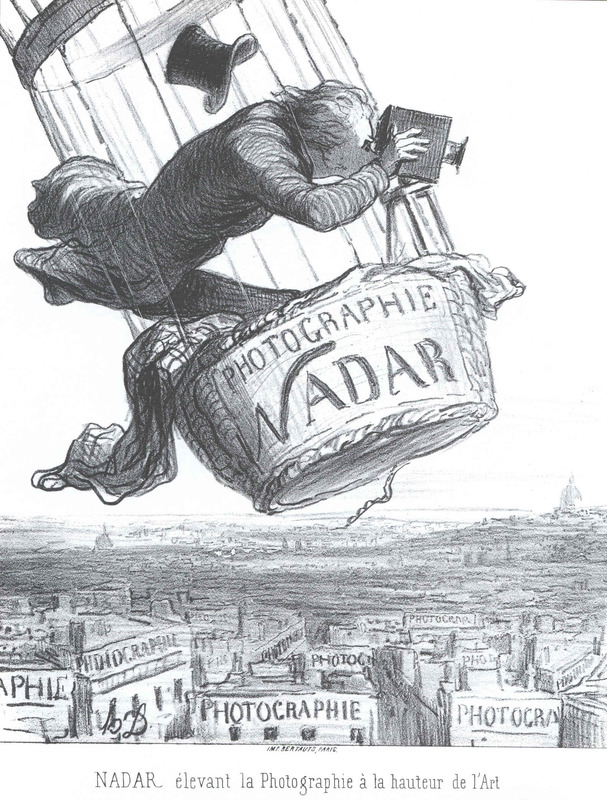 When Nadar later came out with a popular series of aerial photographs, Daumier seized the opportunity “to mock at Nadar’s claims of raising photography to the height of art” (Gernsheim 58). As a comical yet serious critique on the new medium of photography, Daumier’s print illustrates some of the tensions between immediacy, hypermediacy, and remediation put forth by Jay David Bolter and Richard Grusin in Remediation. “Photography,” they write, “provides an important example of the social debate that can surround the logics of immediacy and hypermediacy” (Bolter and Grusin 72). Yet far from being something entirely “new,” they argue, photography was merely a remediation of painting, a “mechanical and chemical process, whose automatic character seemed to many to complete the earlier trend to conceal both the process and the artist” (Bolter and Grusin 25). Nonetheless, as evidenced by Daumier’s sarcastic take on both the literal and figurative “elevation” of photography, the debate over whether or not photography went “too far” by eliminating the artist altogether was indeed a lively one (Bolter and Grusin 25). Furthermore, if the logic of immediacy is that “the medium itself should disappear and leave us in the presence of the thing represented,” Daumier’s choice to repeatedly inscribe the word “Photographie” on the buildings below Nadar can be read as a deliberate attempt to remind and/or warn viewers of the still-mediated nature of photography (Bolter and Grusin 6). In this respect, Daumier’s hypermediated print cautions its audiences not to be seduced by the photographer’s false claims of achieving transparency. Finally, a particularly chilling aspect of Daumier’s lithograph is the way in which it foreshadows a modern surveillance society. There is something implicitly intrusive about a man with a camera flying in a balloon above the streets of Paris, and this print succeeds in capturing that sentiment. Yet even more explicit is the fact that Nadar’s balloon was repurposed for military use during the 1870 Siege of Paris. In fact, the photographer himself even commanded an “observation balloon corps” (Gernsheim 58). In this respect, “Nadar elevating Photography to the height of Art” can be viewed as an anticipation of Foucault’s metaphor for modern society as a “Panopticon” (Webster 223). In any case, like most good comedy, this initially humorous lithograph certainly has a more serious side, particularly when viewed in the context of Remediation, The Structural Transformation of the Public Sphere, and Theories of the Information Society. Bolter, David J. and Richard Grusin. Remediation: Understanding New Media. Cambridge, Mass. : MIT Press. 2000. Print. Daumier, Honoré. “Nadar elevating Photography to the height of Art.” 1862 lithograph. Google Images. Web. 26 September 2012. Gernsheim, Helmut . A Concise History of Photography. New York: Dover Publications. 1986. Print. Habermas, Jürgen. The Structural Transformation of the Public Sphere: An Inquiry into a Category of Bourgeois Society. Trans. Thomas Burger. Cambridge, Mass. : MIT Press. 1989. Print. Webster, Frank. Theories of the Information Society. 3rd Ed. London: Routledge. 2006. Print. Reblogged this on Post-Digital Nomad.